Regional restaurant chain Fresh To Order, with locations in Georgia and Tennessee, has added a new salad to their Gluten Free Menu. You won't find this "Fall Seasonal Salad" mentioned on their website, but it's gluten-free and consists of arugula, goat cheese, candied walnuts, roasted butternut squash, house-made spiced pear chips, and citrus viniagrette. 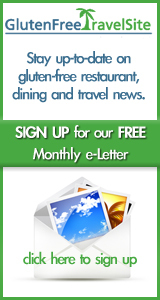 To view Fresh To Order's full Gluten Free Menu -- and access "Buy One, Get One Free" coupons for entrees and salads -- visit their page on GlutenFreeTravelSite.